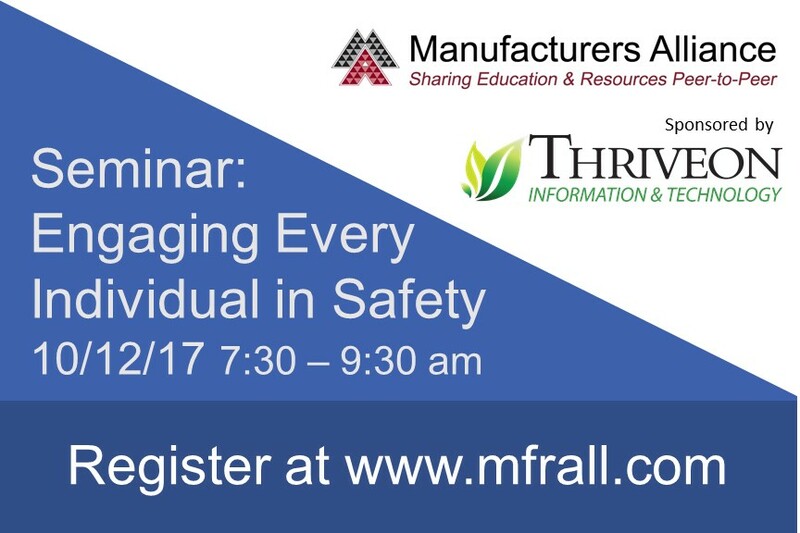 New Ulm, MN 9/6/2017 – Thriveon, a Minnesota IT service that combines strategy and management is the sponsor for the Manufacturers Alliance seminar on October 12th, “Engaging Every Individual in Safety.” At the seminar, three speakers will be presenting ideas on how their manufacturing companies have been able to keep safety top of mind with their employees. For any business, keeping employees safe includes ongoing awareness of cybersecurity. Thriveon offers cybersecurity training to clients to help them create a culture of safety as people work with technology. Thriveon is a member of the Manufacturers Alliance. We work with manufacturing companies to fully support internal IT staff or to provide a whole IT department for companies with 20 – 500 computers for a fixed monthly fee.